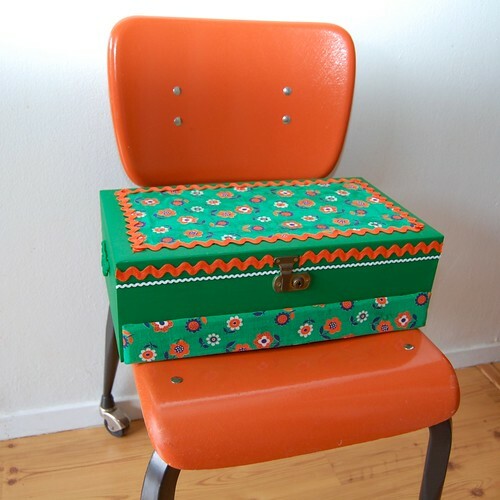 I have a soft spot for vintage crafts. 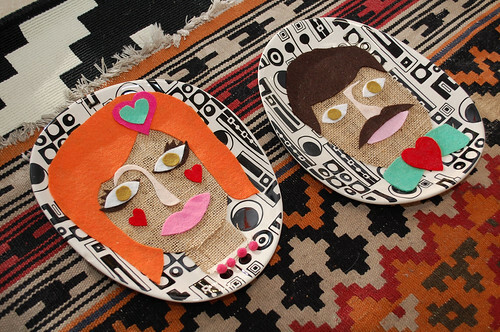 Each time I see a pair of plates with a spiffy felted couple on top I’m tempted to buy them. Finally today, I broke down and made my own Valentine’s Day themed pair. A little different from the traditional pair with the lady in her veil and hat and the mister with his pipe. 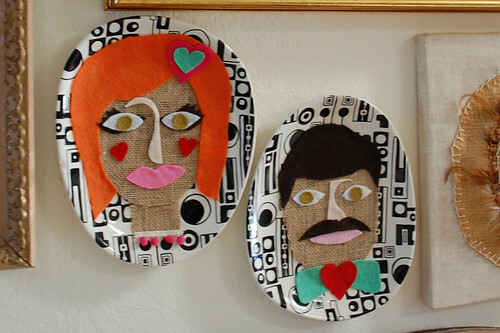 The first thing I did was cut out my shapes from felt and burlap. I wanted to have everything done and placed before I busted out my glue. A tip is to take a picture with your cell phone before you disassemble to glue. Using Aleene’s Tacky Tape I first applied my burlap faces. Burlap is loosely woven so I didn’t want to use a wet glue because it would come through. My plates are slightly oblong and amoeba shaped so I did each face a different direction on the plates. Piece by piece using Aleene’s Tacky Glue I applied my felt detail pieces. I added a few hearts for good measure to get me in the Valentine’s Day mood. 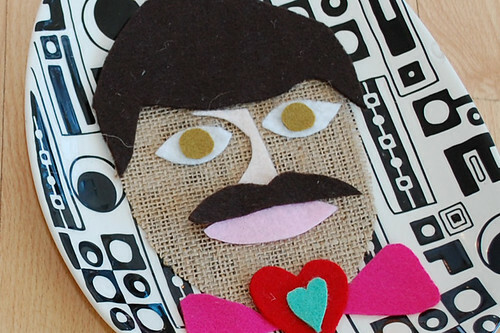 I named the piece: “Hey Valentine, would you like toupee with me?” since it looks like the dude is sporting a hair piece. 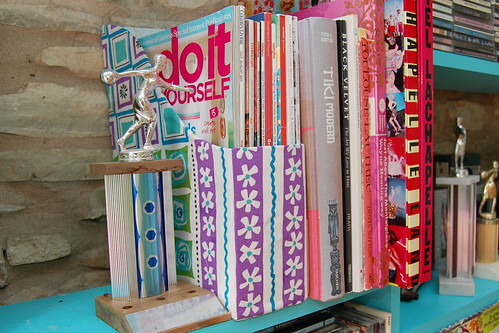 Now I totally want to go through my library of vintage craft books and find something else to revamp and put a new spin on! 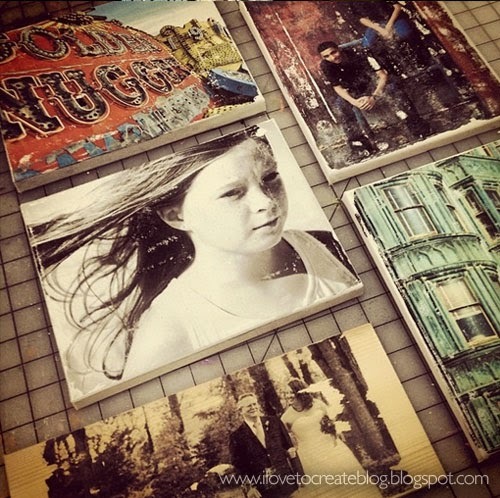 We've been in a BIG image transfer mood these past couple of weeks in the design studio here at iLoveToCreate! I printed out several of some of my original photography and my crafty friend Miranda has been helping transfer them onto canvas and wood. 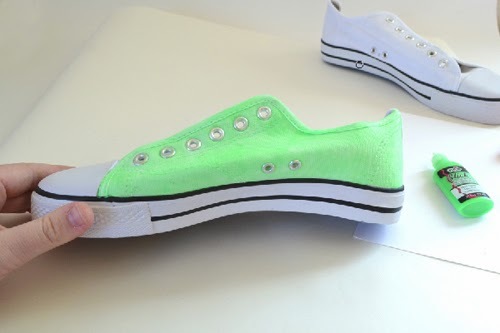 They have been turning out so awesome & distressed. 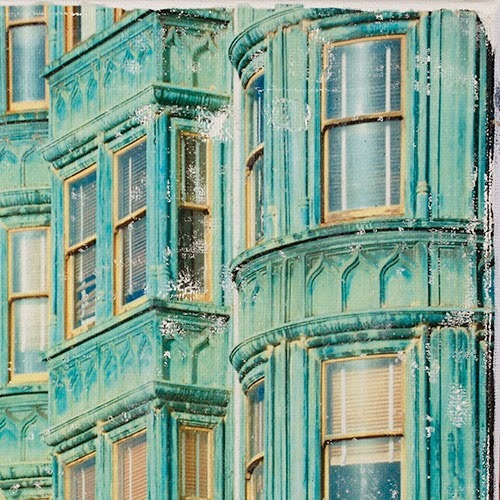 The photo transferred above actually looks almost like painting. Let me show you how we did this cool and artful technique! I promise you are going to want to try it for yourself once you see how easy it is to do! Before you begin: Using your photo editing software program, size a photo of your choice to fit the dimensions of your canvas. In this case, my canvas was 8"x10", so I sized the photo to be 8"x10" and then printed it out on LASERJET. 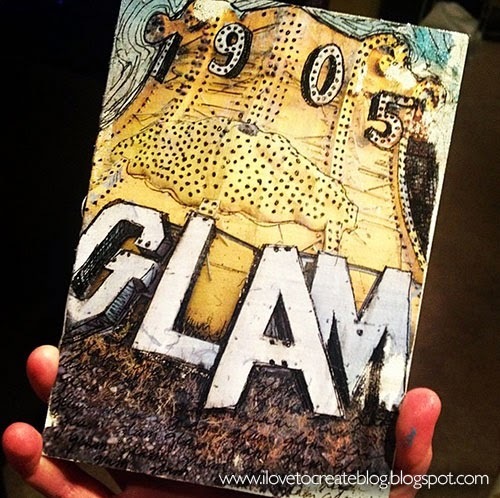 Note: We've seen this project created with other collage & decoupage mediums in the marketplace. 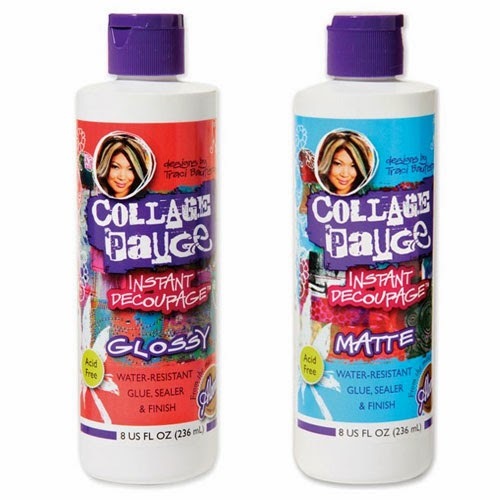 What makes Collage Pauge different is that there is no odor and you get less visible brushstrokes compared to other products! Now back to the project!!! Cut out around your image with scissors. 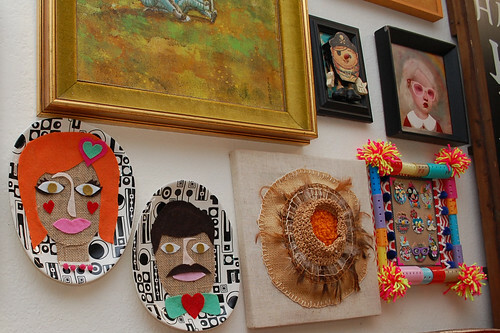 Squeeze out a generous amount of Collage Pauge onto your brush. 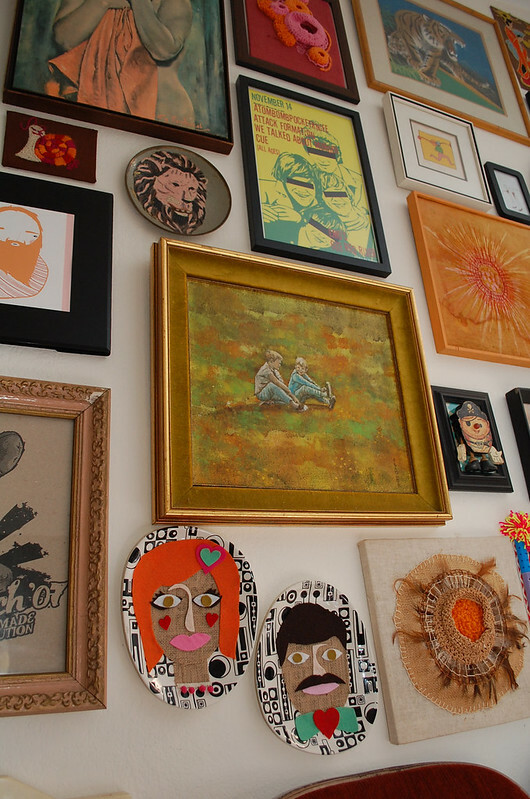 Spread the Collage Pauge back and forth in one direction covering the entire image. 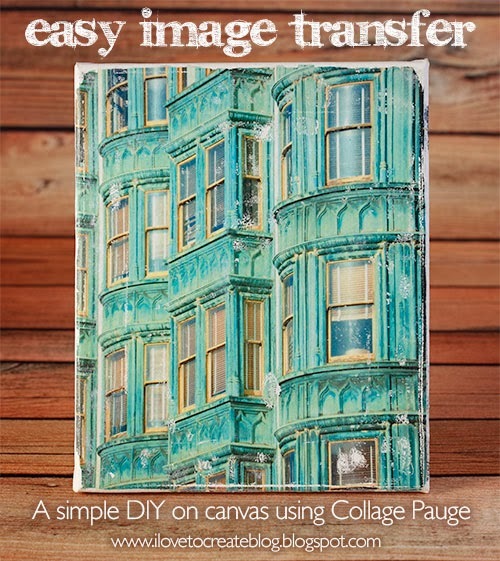 Flip over your pauged picture and position it flat on the canvas.
. Use a gift card to smooth out an air bubbles and to create a tight bond of the Collage Pauge to the canvas. Let it sit 4-6 hours or overnight. 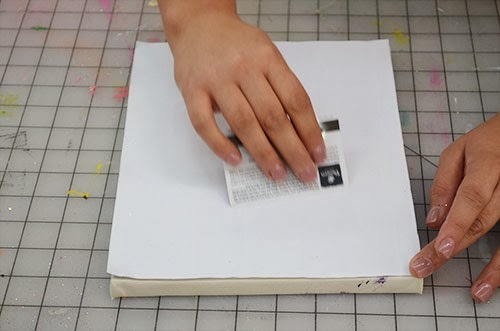 Wet your finger or a sponge with a bowl of water and start gently scrubbing off the paper. 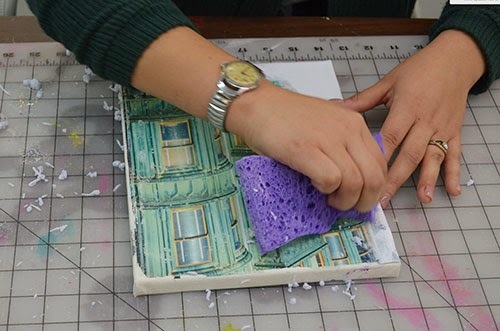 This is the most time-intensive part of the process, so be patient with it! A thourough and even light scrubbing will produce the best results. Here's what it looked like after scrubbing off most of the paper. 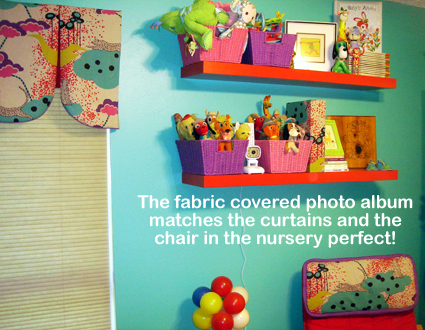 Some areas will look more distressed and scrubbed than others. For this technique, this is actually a good thing! 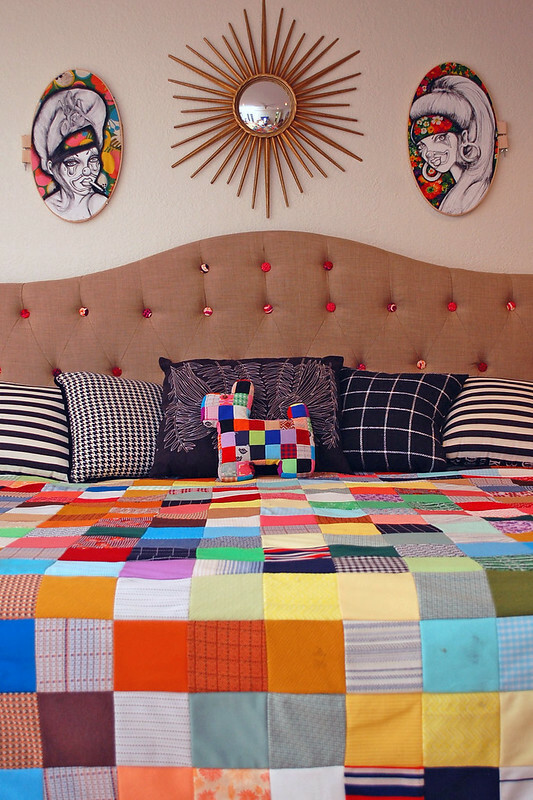 It gives more artful character to the finished piece! Even after you think you are finished scrubbing, you will want to go back in and scrub some more. You will know when to stop scrubbing when there's no paper pulp left when you let it air dry. 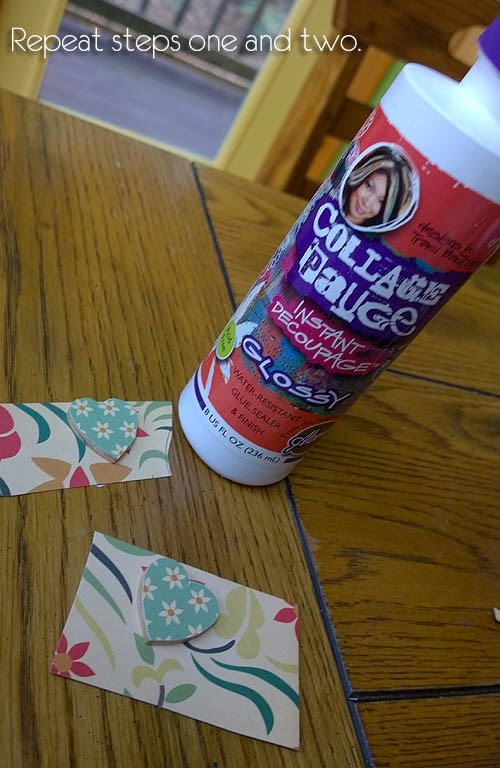 When you are finished, you can go back and add another coat of Collage Pauge to seal and give it a finished look! Here's a fun vine we made showing the process to give you a better idea! Here's a close-up detail of what the canvas looked like when finished. 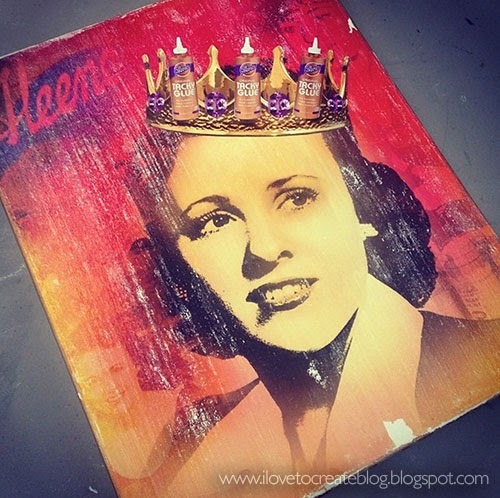 Here's another example of a canvas that we made using vintage images of Aleene Jackson (the inventor of Tacky Glue). We gave her this canvas as a 90th birthday present last week. 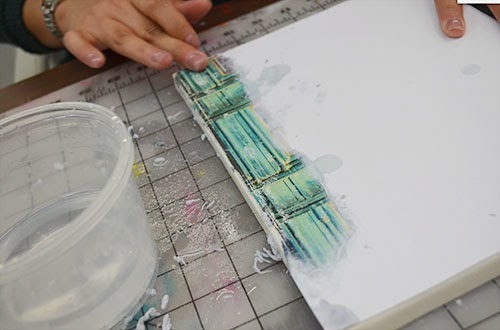 Another way to use this technique is to incorporate it into your mixed media process. For example, after I transferred this image I took of some signage at the Neon Boneyard in Las Vegas, I went back in with a pen and doodled on top. It gave it a hand-drawn look that I love. And here's some more examples of our work from this week. We even transferred a photo onto wood. That's me and my daddy on my wedding day at bottom on the wood surface. The wood grain even popped through! 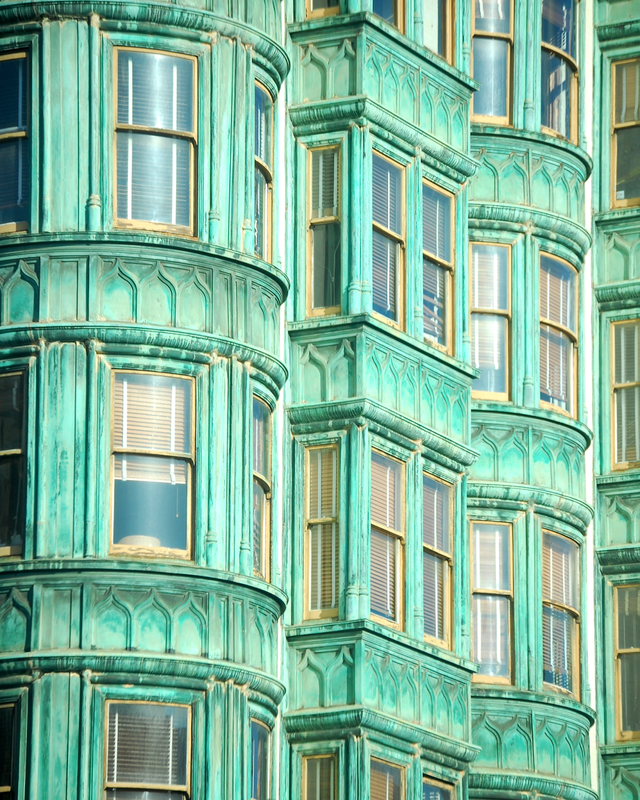 What do you think of this process? Does it look like a cool new technique you'd like to try with your photos? 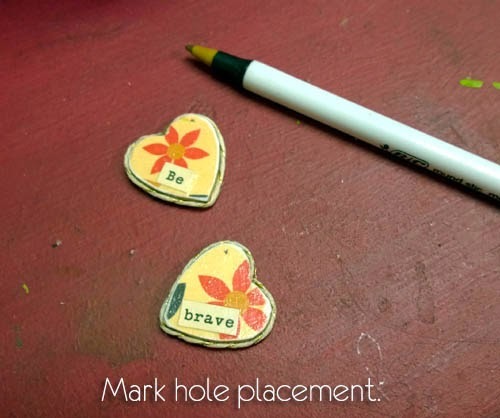 Use the same heart to trace small "cutouts" out of the full heart (to show the waxing and waning phases), as shown. Shade in the area you intend to cut so you don't get confused and have to start over! 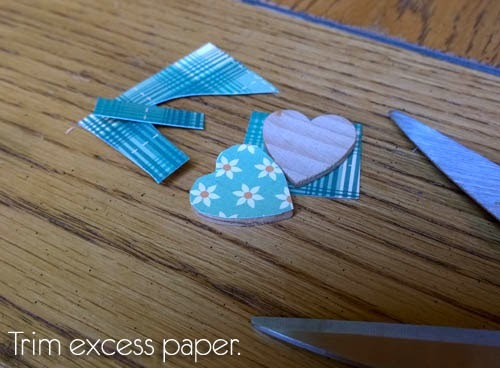 Carefully cut out the shaded areas of the varying heart shapes from the freezer paper to create the stencil. Lay the T-shirt flat. Center and iron the stencil (still shiny surface down) onto the front of the shirt. 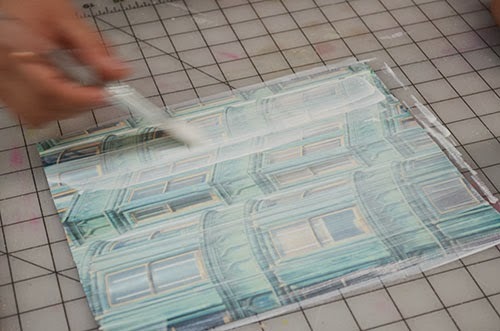 Prepare your paints, insert an extra sheet of freezer paper between the layers of the shirt (to prevent the paint from bleeding through), and carefully apply the paint lightly over the stencil. Continue until the entire design is covered. Apply extra layers of paint if you're working on a darker shade T-shirt. 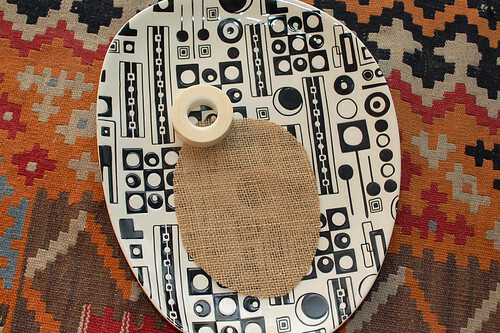 Carefully peel back the stencil and let it dry completely. 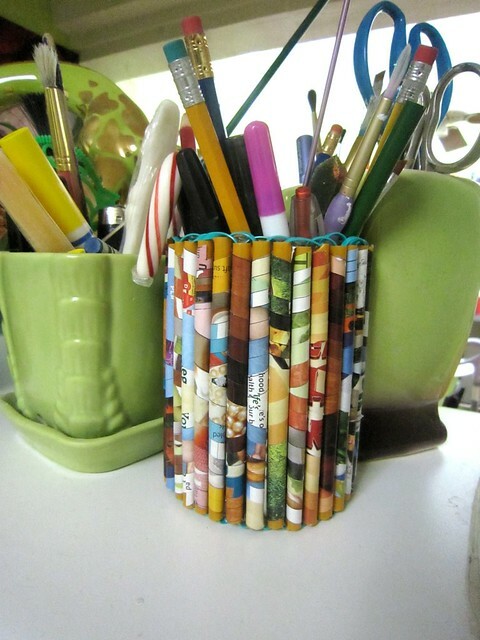 Remove the scrap paper, and try it on! BONUS! 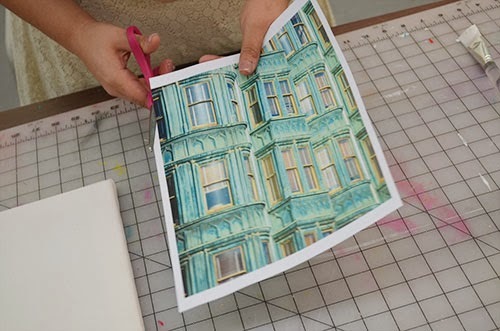 Before you toss those scraps of freezer paper that you cut from your stencil, iron them onto another T-shirt in the same configuration, and use Tulip Fabric Spray Paint to cover over them. Let dry and peel them back to get a reverse image--a companion to the original Phases of the Moon T-shirt. I call it "Total Eclipse of the Heart" T-shirt. 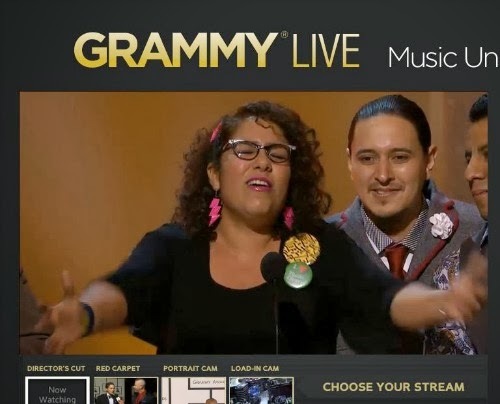 Yesterday, the Los Angeles band, La Santa Cecilia took home the award for Best Latin Rock, Urban or Alternative Album! Why are we so excited for them? 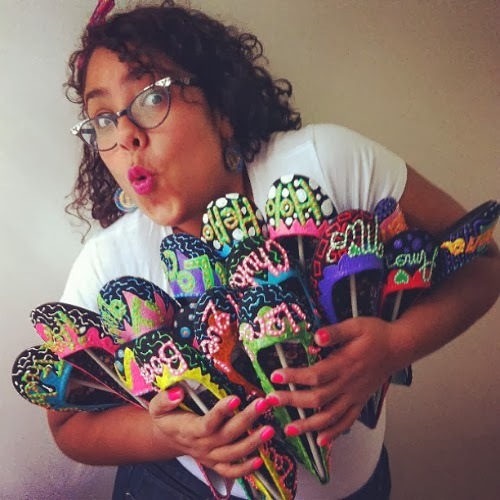 Well, because lead singer (and now Grammy winner), Marisoul is an avid crafter. One of her specialties is making her colorful wardrobe ensembles for her performances - which includes numerous pairs of dance shoes that she embellishes with PUFFY PAINT! Read on to see her magical shoes that she paints, and music videos too! 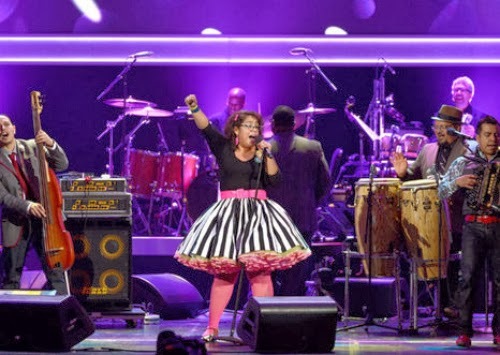 Marisoul performs at the Grammys in her awesome puffy paint shoes! Even cooler, when the band performed yesterday at the Grammys pretelecast, she wore her hand beautiful painted shoes! While everyone else was sporting designer this and that, Marisoul wore her own original creations and made her own fashion statement at the Grammys! 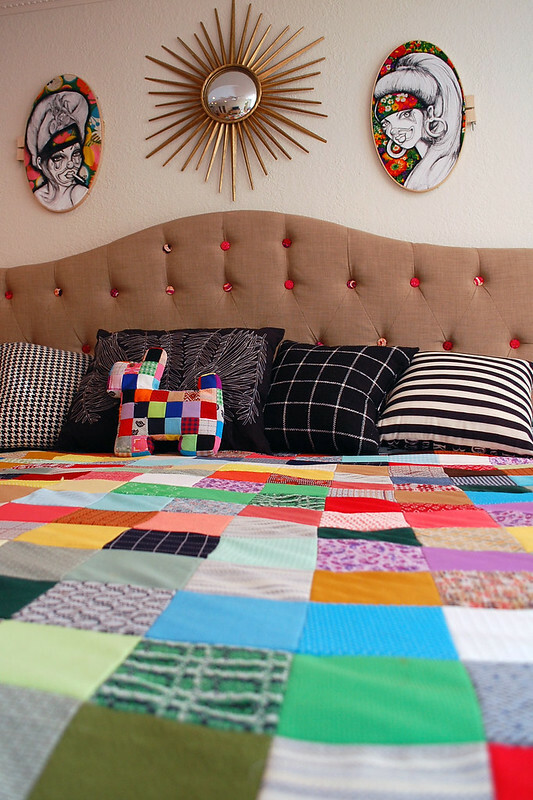 We love that she creates and embraces her own style and inspires others to do so as well. Here is a video so you can see and hear the band's music, followed by an interview I did with Marisoul last year. 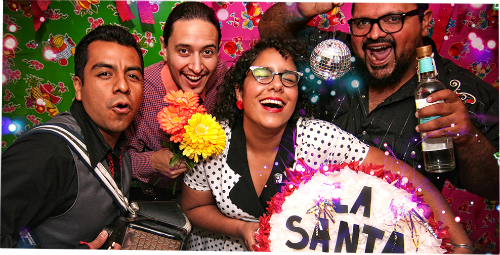 Again, congrats to La Santa Cecilia from all of us here at iLoveToCreate! Keep the creativity flowing! 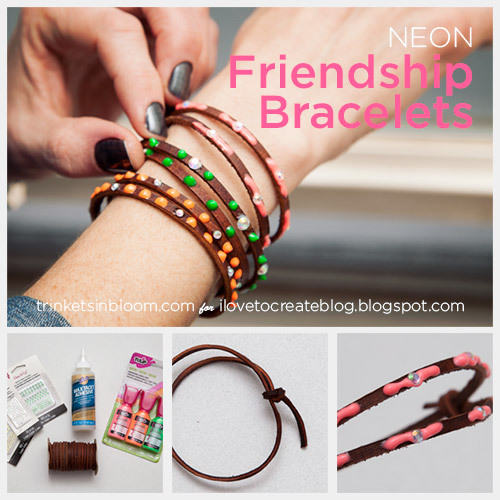 Neon is making a comeback and these DIY Neon Friendship Bracelets are one cool way to add some serious color to your arm candy and they have a bit of sparkle! 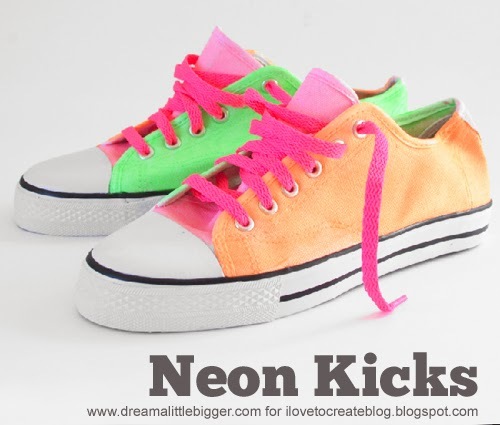 OK, so neon is on it’s fourth or fifth come back. But, this time there are so many new and creative ways to incorporate it into your wardrobe without looking completely ‘80’s dayglo! 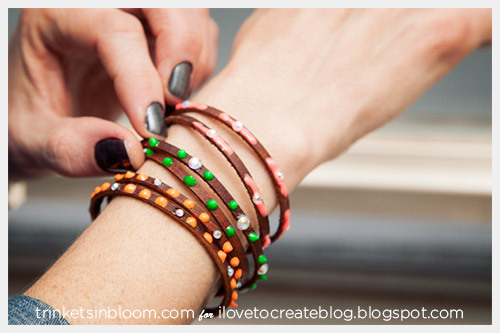 These bracelets so quick and fun to make you’ll want to make lots and that’s good because they look amazing stacked together and don’t forget to make them for your friends too! 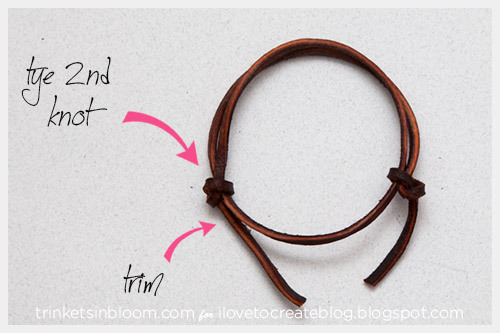 Cut your leather cord long enough to wrap around your wrist a little more than 2 times. I cut mine 21 inches long. Get the ends of your cut cord wet and wiggle them back and forth to soften them up. 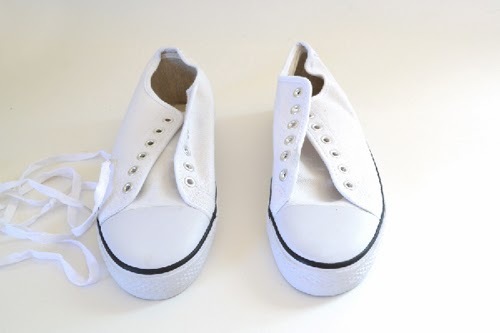 This will make it easier to tie them and will also help your knots hold better. Wrap your cord around into a circle and tie one end around itself in a knot. 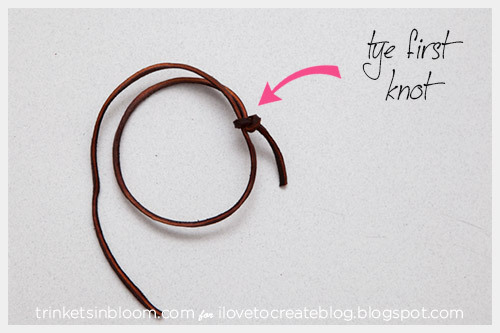 Pull your knot tight but still loose enough that it can slide on the leather cord. Tie your second end around the other side of your circle. You want your bracelet to be large enough to fit over your hand but you should be able to tighten it to fit more snugly on your wrist. You can trim any extra cord on your knots, but be sure to leave about a half inch. You don’t want to cut it too short. 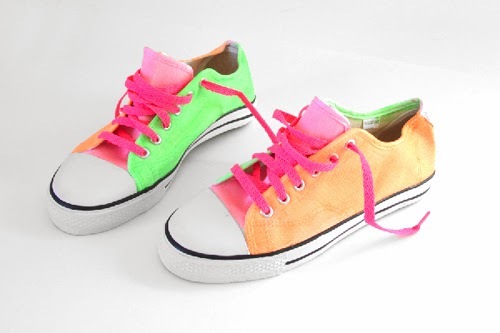 Using your Tulip Slick Neon Fabric Paints you can create fun patterns and designs on the leather cord. 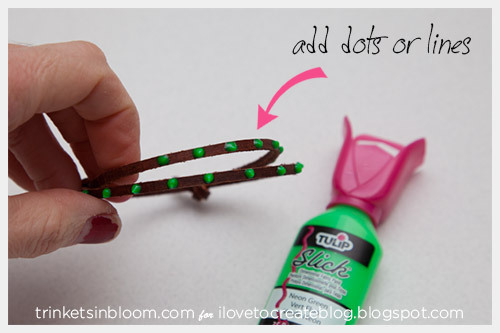 TIP: Make sure your bracelet is open to a size that will fit over your hand when you paint it, otherwise your paint won’t let your knots slip to let you open and close it. Before your paint dries you can add your Tulip Glam-it-Up Crystals to the paint. 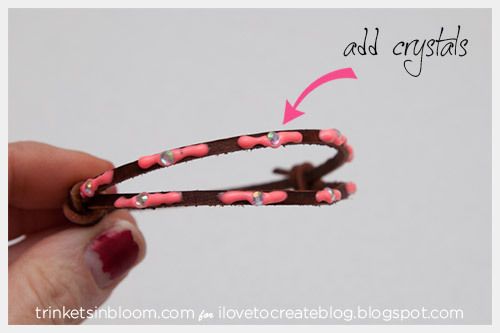 Or you can add your crystals directly to the leather cord using your glue. 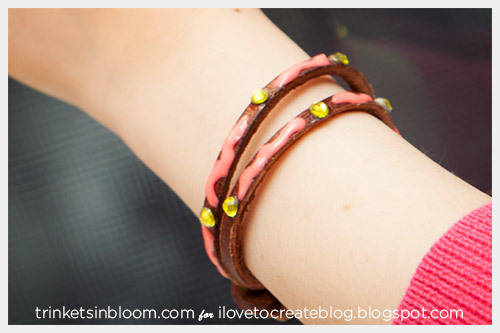 Mix up your colors and add lots of sparkle to these bracelets! These would be great to make with friends and share when you’re done. Because you can never have too many friends or friendship bracelets! 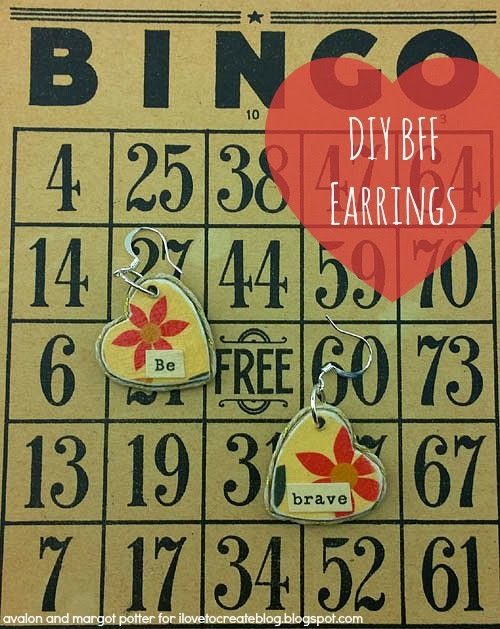 To see more fun fashion DIY’s be sure to check out my blog Trinkets in Bloom! Ok this time I’m serious. No really. I mean it. It’s time to get started on those resolutions. I have 768 of them, but one of my goals for the year is to do one home improvement thing per month. I have lot’s of projects waiting to be painted, re-upholstered, sanded, revamped and in today’s case re-tufted. 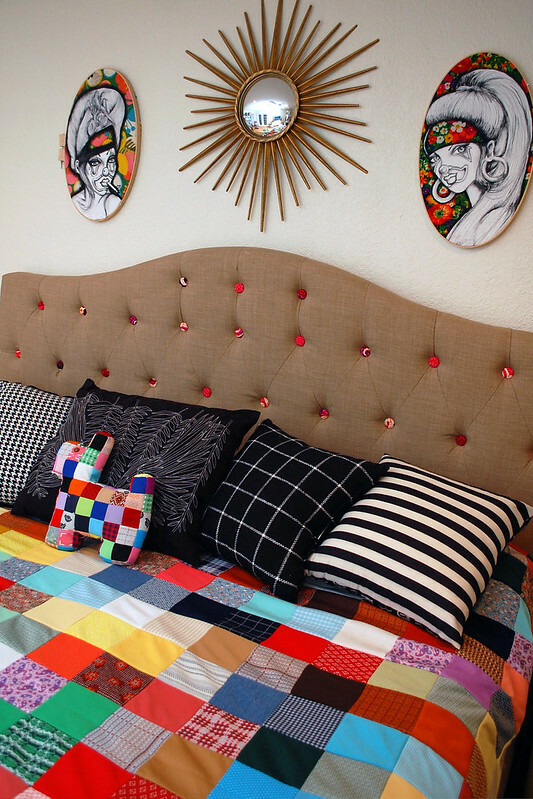 I decided to start the year off with a bang and a big project so I am revamping my headboard. 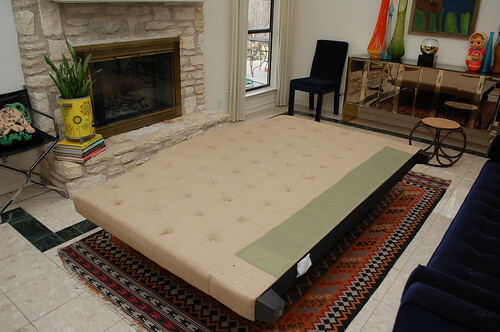 I must admit I was inspired by the Erin bed and sofa from World Market. Man I love that store. 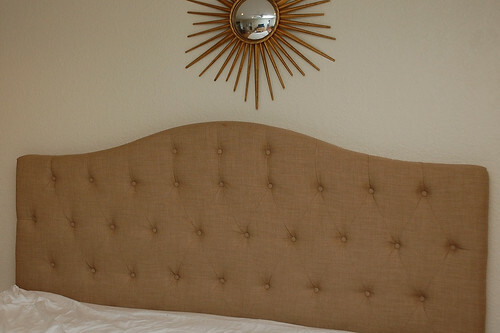 However, when my mother found a beautiful linen camel back headboard at Tuesday Morning I knew I could make this puppy my own in a jiffy. I toyed with the idea of painting the whole thing, but in the end decided to go the covered button route. My thumbs hurt from pushing all those little buttons into the button maker, but it was worth it. Finally the master bedroom is on the way to fabulous. Lucky for me I am a fabric hoarder. I don’t like to sew, but I can cover a button and applique like nobody’s business. 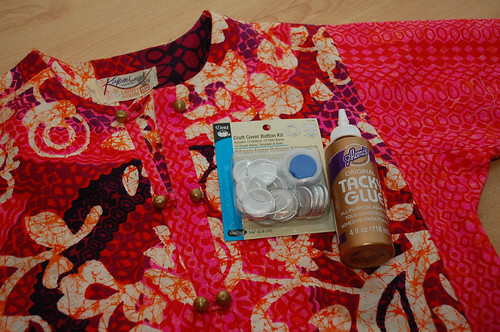 I actually attacked an innocent vintage muu-muu for this project. 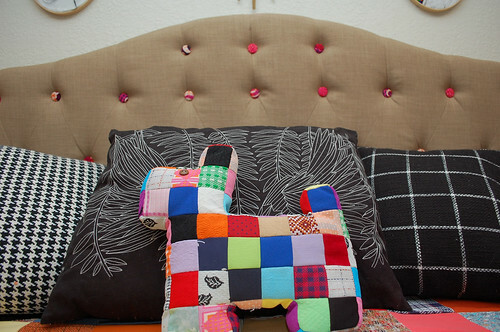 The bright 60’s neon pinks against the prissy tan headboard was a marriage made in crafty heaven. 5 packs of Dritz Craft Cover Button Kits size 1 1/8”s were used. That’s 50 buttons people. Ya, did I mention my thumb hurt? Anyway, the button cover kits come with everything you need. Lucky for me there were even shankless button backs to cut down on my workload. All that was left to do was cut, pop and watch Bravo. 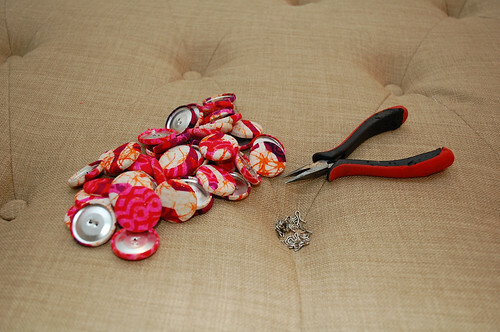 When I had a pile of buttons I took my headboard and placed it on my coffee table. I wanted my glue to be able to sit for as long as possible before I put the headboard back on my bed. A few of my buttons did have shanks. Nothing a pair of pliers can't fix. 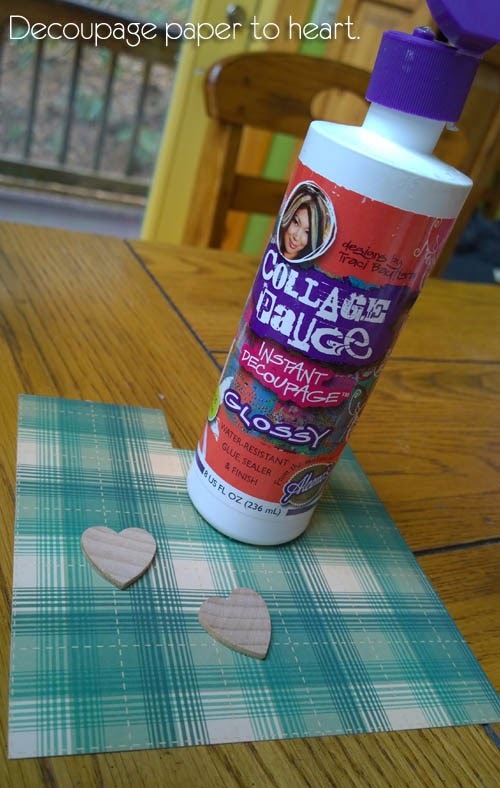 Oh Tacky Glue, is there anything that you can’t hold tight? Even my toddler has tried to pull these buttons and he can’t. 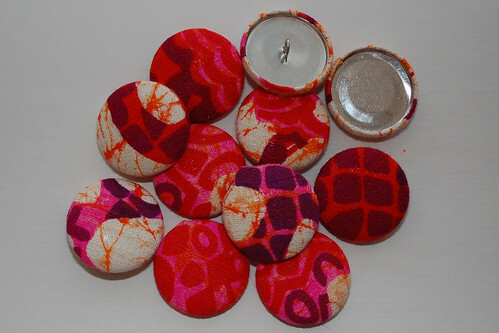 I applied a big gob on the backs of buttons and let them dry completely. All that was left to do was put my new and improved headboard back in place. I do love pink and tan. My sister Hope Perkins was kind enough to give me a couple of pieces of her art that were done on vintage muu-muus. I thought the more Hawaii the better. This room is still a work in progress, but I feel like with my headboard I'm one step closer to finished. Best friends are forever, true blue and faithful to the end. 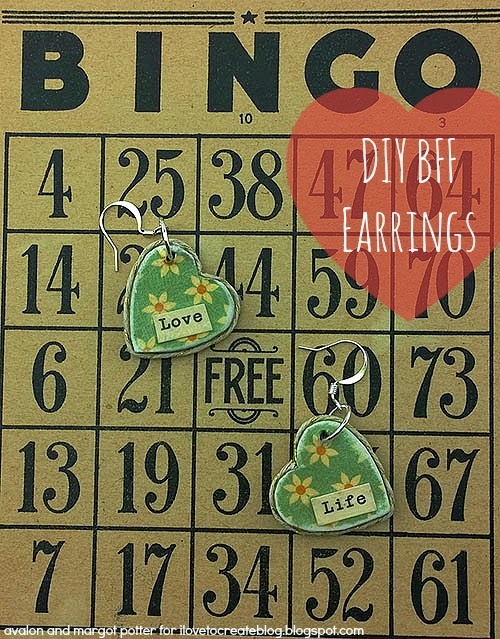 Why not show your BFF a little love with these super simple DIY BFF Earrings? 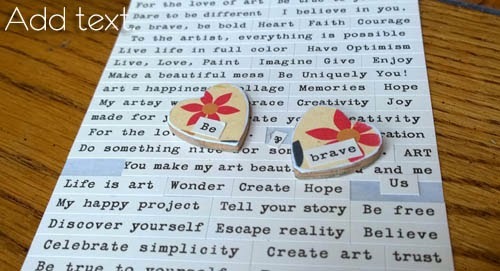 A little paper, some decoupage medium and twine turn craft store wooden hearts into two sided earrings that are sure to cheer your BFF up every time she wears them! PLUS they're cute coming and going! Avalon and I put our heads together here, she loves these muted colors and simple jewelry, I scaled back on my usual over the top size to make them easy and comfortable to wear every day. 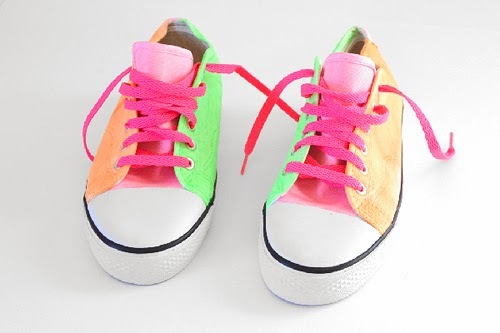 These are perfect for a trend savvy teen. 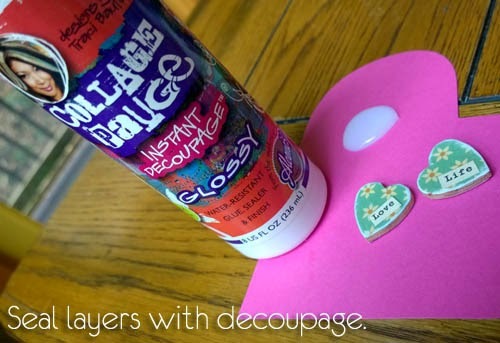 Spread a thin layer of decoupage medium on one side of hearts, place on paper. Let dry for ten minutes. Repeat steps one and two on opposite sides of hearts. Sand edges on both sides with extra fine sandpaper. 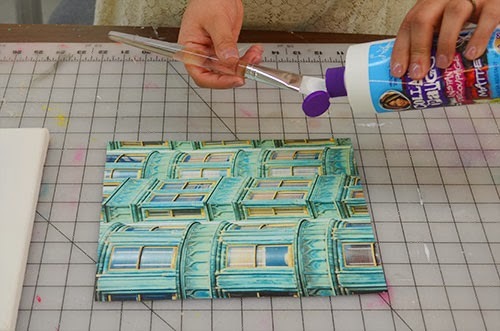 Seal layers with two coats of decoupage medium on both sides. 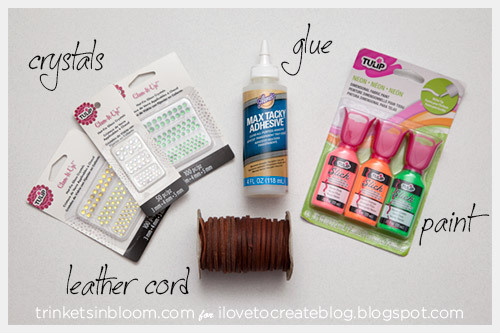 Measure and cut cord to fit around hearts. 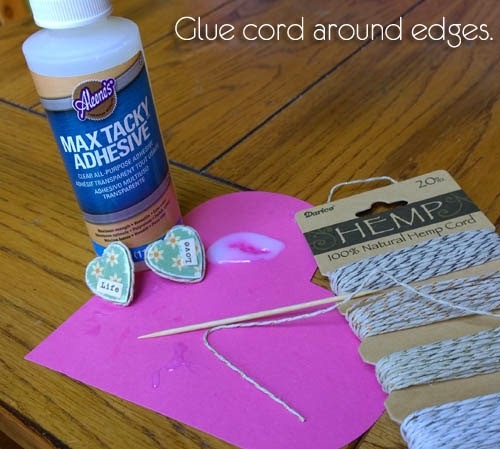 Spread a bead of glue along edge of hearts and attach cord. Use a toothpick to press and secure the cord ends in the divot of the hearts. 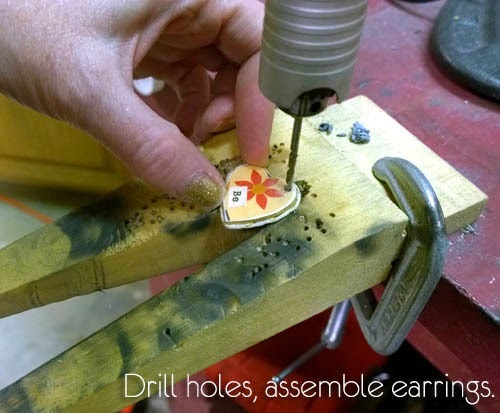 Use a pen to mark your drill hole placement, make sure you have a left and right earring! Drill the holes, carefully. Sand any excess paper from holes. 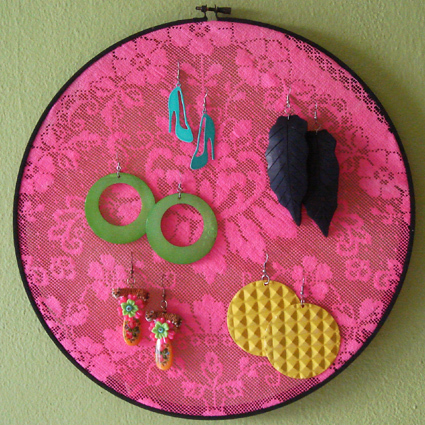 Attach a jump ring to each heart and attach this to your ear wires. Fun, fast and fabulous! This would be a fun 'Girls' Night In' Project and makes for a delicious and calorie free Valentine's Day gift! What's not to love? 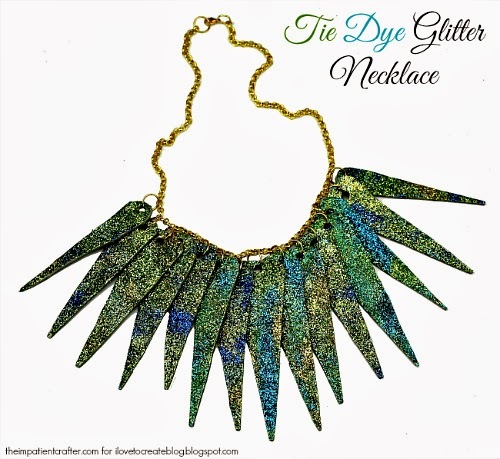 For more quick and easy craft ideas visit me us The Impatient Crafter and for Fashion and Style you can find us at DIY Doyenne! 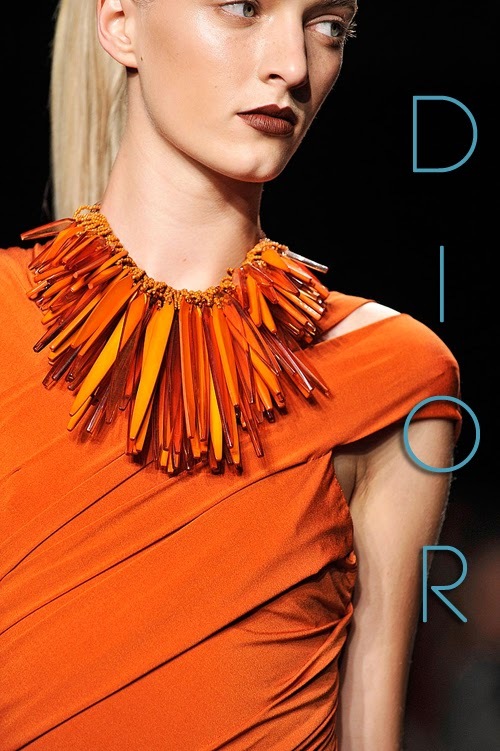 This Tie Dye Glitter necklace was inspired by this fabulously over the top Dior runway design below. I LOVE the layers upon layers of points in the Dior, but I wanted to make something a little more ready to wear. 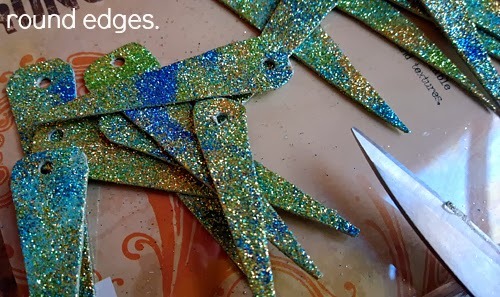 It started with the shape, then the idea of giving it texture, color and sparkle with layered glitter. I like to experiment with unconventional materials when creating jewelry. There isn't much that escapes my creativity! 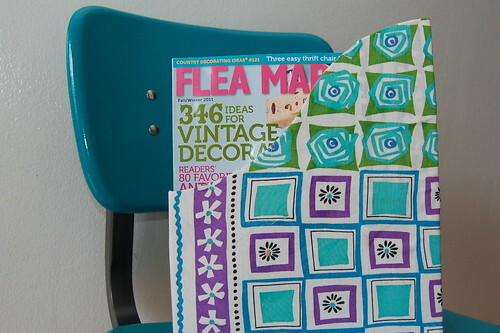 I'm thrilled with how this design turned out, it's fun and funky and right on trend. 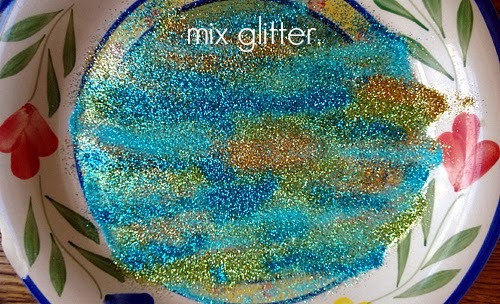 The tie dye glitter technique could be fun for all sorts of creations and iLoveToCreate products make this mostly mess and stress free. 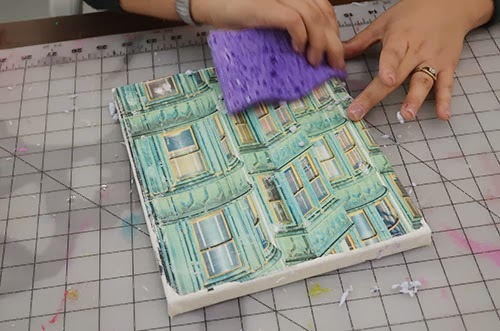 Here's how to make one of your own! The spikes are 1" wide and 6" long. Mark every inch on top of an 8x12" sheet of Grungeboard or Chipboard. Mark each 1/2" interval 6" down from the top as in photo. Cut off excess sheet on bottom. 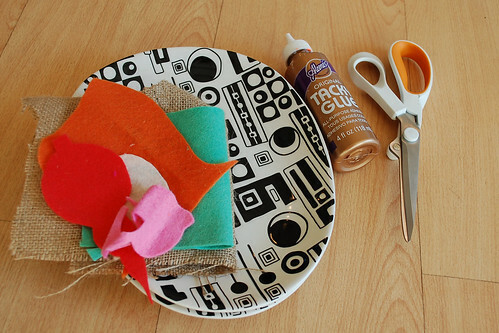 Pour glitter on a plate in layers. 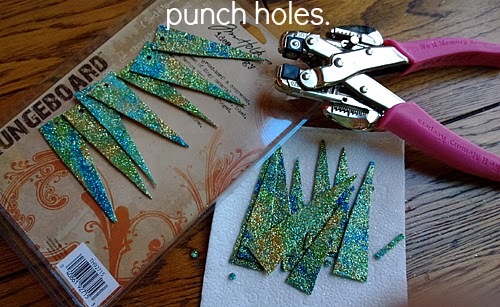 Use a toothpick or stick to carefully blend glitter into striations as in photo. This gives the points the tie dye effect. 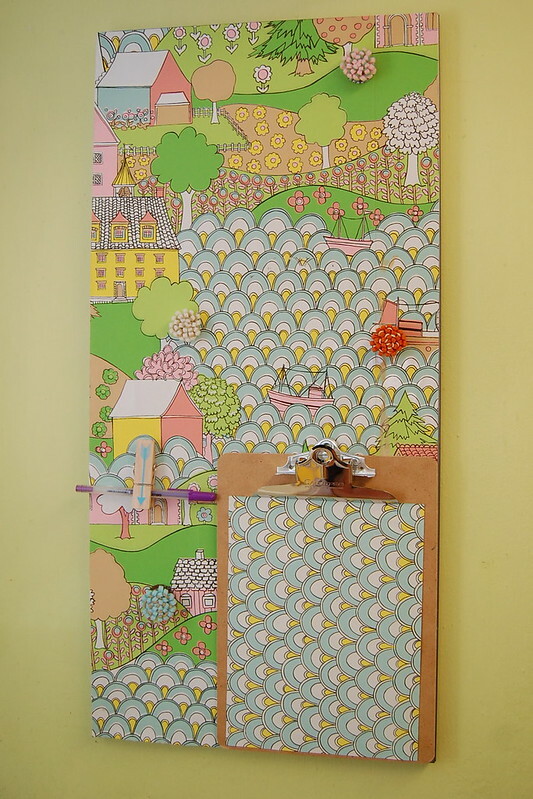 Place Fabric Fusion sheets on front side of pre-marked board. 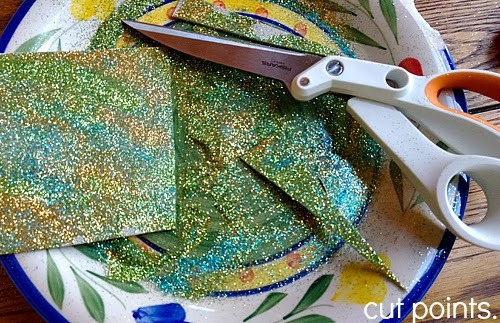 Dip into glitter, coating thoroughly. Repeat on back side of each sheet. 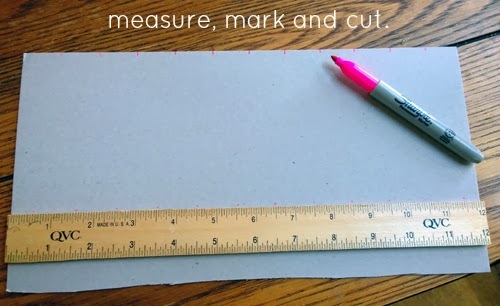 Use sturdy scissors to cut points using the marks you made earlier as guides. Punch holes in top center of each point. 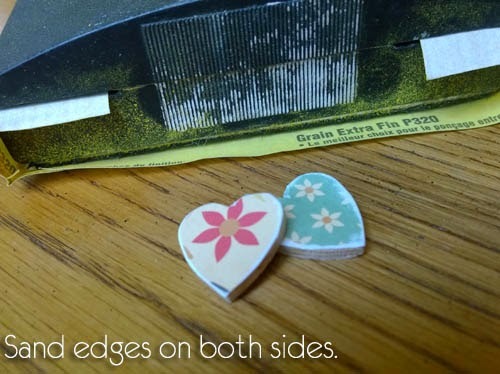 Use scissors to round edges and tips of points. 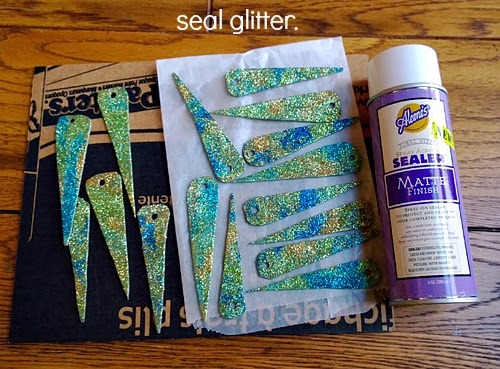 Spray front and back of each point to seal glitter. 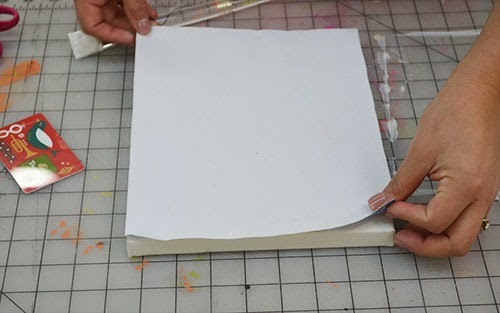 Put wet points on wax paper or parchment paper to keep it from sticking while it's wet. Let dry overnight. 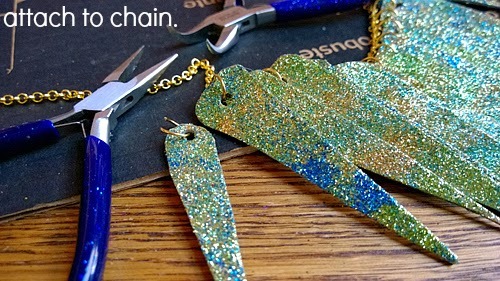 Attach daggers to chain using chain and bent nose pliers. Attach a jump ring to each chain end. Attach clasp to jump ring on one chain end. That's it! Fun, fast and fabulous! 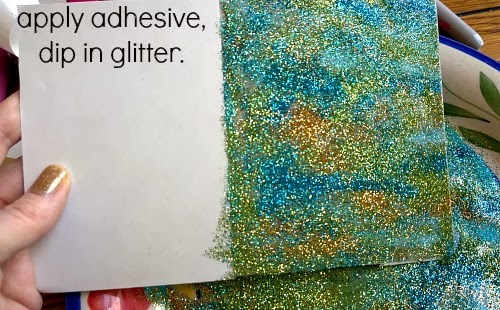 Try mixing up different colors of glitter for different effects. Add more points. change the sizes, we'd love to see what you do with this idea! 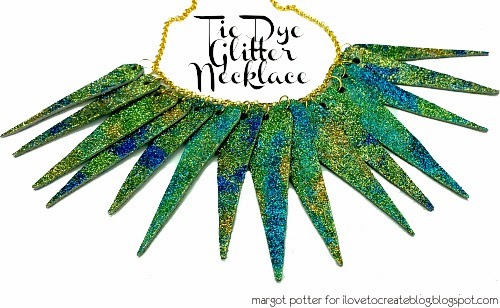 Visit iLoveToCreate on Facebook to join the crafty conversation. 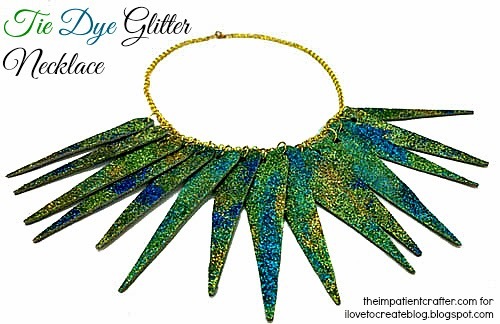 Visit me at The Impatient Crafter for fun, fast and fabulous craft ideas and DIY Doyenne for DIY fashion and style.